79. 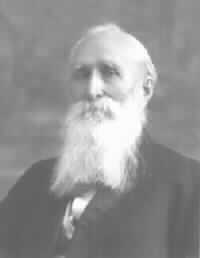 Daniel Jonah5 EVANS (Jonah6, Lewis7)(110) was born in Trelech, Carmarthen, South Wales, United Kingdom, April 30, 1823. He died December 9, 1916 in Scranton, Lackawanna County, PA, at 93 years of age. His remains were buried in Forest Hill Cemetery in Dunmore, Lackawanna Co., PA. He married Sarah PROTHEROE February 24, 1849. (111) She was born October 8, 1826. Sarah(112) was the daughter of David PROTHEROE and Unknown UNKNOWN. She died January 4, 1892 at 65 years of age. 80 i. Frances Mary ('Frankie')4 EVANS(113) was born in Jeansville, (?Schuylkill), PA, November 20, 1849. She died June 25, 1929 in South Gibson, Susquehanna County, PA, at 79 years of age. She married Williston Alonzo CHAMBERLIN May 4, 1869. (114) He was born May 4, 1846. (Additional notes for Williston Alonzo CHAMBERLIN(115)) He died March 26, 1930 at 83 years of age. Williston's occupation: Millwright. 82 iii. Elizabeth May EVANS(120) was born, May 10, 1854. She died October 18, 1934 in Merchantville, Camden County, NJ, at 80 years of age. She married Owen Waldo JAMES March 16, 1880. (121) He was born in Washington, DC October 30, 1848. (Additional notes for Owen Waldo JAMES(122)) He died 1906 at 57 years of age. Owen's occupation: Baptist Minister. 83 iv. Jessie Fremont EVANS(123) was born near Gibson, Susquehanna County, PA, February 22, 1857. She died July 15, 1906 in Scranton, Lackawanna County, PA, at 49 years of age. She married William John KANN June 6, 1878. (124) He was born April 2, 1855. (Additional notes for William John KANN(125)) He died February 19, 1907 in Scranton, Lackawanna County, PA, at 51 years of age. His body was interred in Forest Hill. William's occupation: Job Printer. + 26 v. Della Protheroe EVANS was born March 7, 1861. 84 vi. Frederick Elmer EVANS(126) was born near Gibson, Susquehanna County, PA, November 22, 1862. He died January 10, 1940 in Buffalo, Erie County, NY, at 77 years of age. He married Anna DUFFY January 29, 1891. (127) She was born September 21, 1868. (Additional notes for Anna DUFFY(128)) She died January 2, 1940 at 71 years of age.